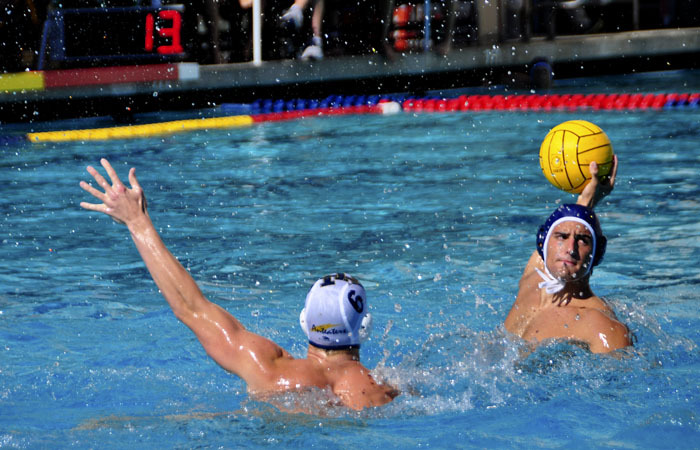 Water polo players tread water; it’s an accepted fact of the game. Touching bottom is a foreign and overall unwelcome experience. Yet in the second and fourth quarters of Saturday’s game against No. 5 UCSB, whenever a No. 3 Cal men’s water polo team member took a shot, his feet touched the bottom of the pool. Campus Pool in Santa Barbara, Calif., slopes from a nine-foot depth at one cage to a little over five feet at the other. The unusual pool consistently trips up opponents and gives UCSB a home “pool” advantage. Although the Bears scraped an 8-7 road win against the Gauchos, they spent the first quarter getting used to the unfamiliar environment and the opponent’s intense focus. According to senior attacker Ivan Rackov, Cal (17-3, 5-1 in the MPSF) came into the match expecting it to be another easy conference win. That mindset was a major mistake. Though a young and inexperienced squad — the roster lacks a single senior and consists mainly of underclassmen — UCSB (14-9, 2-4) burst into the first quarter ready to play. Cal, on the other hand, clearly lagged. But Cal only discovered that when USCB took the first goal of the day. The difference in intensity left the Bears’ offense shaky, and the Gauchos exploited strong counterattacks from their opponents’ missed goals and passes. UCSB also covered Cal’s centers so effectively that goals from that position were impossible. Because of the depth difference in the pool, the teams switched sides at the end of each quarter rather than at the half. In the second quarter, the Bears found themselves back in deep water and were starting to match the intensity of their opponents. They exploded on a five-goal tear. Rackov nabbed two goals in the second quarter on man-up opportunities. Senior Zach Greenwood and brothers Luka and Aleksa Saponjic also notched points to give their team a 6-4 lead at the end of the half. While the Bears couldn’t take back their missed opportunities in the first quarter, they used the remainder of the game to prevent any further mistakes. “Stopping” the opponents might be too generous a reaction; by only allowing USCB to capitalize on two of 11 power plays, the Bears completely shut down their conference rivals. Cal, in comparison, scored on six of their nine man-up opportunities.